After almost 800 hours of work, attending hackdays, thousands of lines written (and thousand of lines deleted again) it's finally done: Version 1.0 of Detlef Gpodderson has been released on Google Play. Excuse me, but who is Detlef? 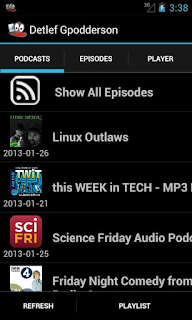 Detlef is the code name of a gpodder.net client for Android 4+ devices. It was created by a team of 6 students during a university course on software engineering tutored by Stefan (@horrendus) and released under the terms of the GNU GPLv2 license. 800 hours of work may sound like a lot for such an app - but the course focused in large parts on project management, organisation and documentation. So the 800 hours did not go exclusively in coding as one might think. The resulting software forms a good basis for further development, and contributions are very welcome! Sounds nice, but what can I do with it? All that’s left to say is: Have fun with Detlef, and send us some feedback! If something does not work in this first version, please file a bug or even send a pull request - we are sure that we can iteratively improve the application to a point where it's the best podcatcher on Android. 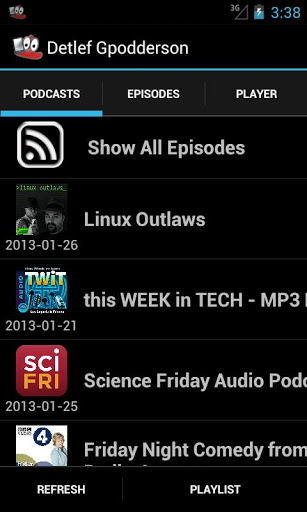 I like it better than anything I've had available for my podcast catching, and love that it sort of synchronizes with my other computers via gpodder.net, however; one problem seems to be that it does not get episodes that my computers do. The sync is not perfect and the settings are very limited. BTW! Black background very easy on the eyes, especially at night! Thank you for that. Hi, how can i contribute a translation? I would like to translate it to german. See http://wiki.gpodder.org/wiki/Detlef for how to translate Detlef into your language. Hi - wondering if there is a page for support. I don't seem to be able to Chang the download directory. The option does not appear to be editable.